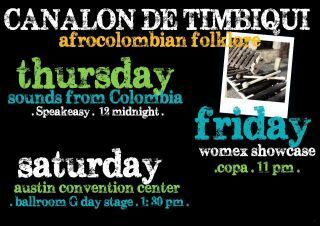 If you (or a friend) is at the SXSW festival in Austin, go see Grupo Canalon de Timbiqui! We already told you once before about Nidia Gongora and her Grupo Canalon de Timbiqui. This is the Colombian group I am most excited about today. One of the highlights of my trip to Colombia last month was the opportunity to spend a couple of nights with Nidia, el Grupo Canalón, and their Timbiquí family. Happy times! Canalón got invited to play at SXSW (South By Southwest), one of the most important music festivals in the US. This is their first time abroad, and they were all in Bogotá applying for their visas. The community of timbiquireño expats hosted Nidia and her group at their home to celebrate the occasion. I had the chance to visit Nidia’s home in Cali a few days later and meet her wonderful family. Before I finished each can of Poker, her husband Jorge had the next one open for me. I never heard “Un canto a mi tierra” – her love poem to Timbiquí in collaboration with Quantic and his Combo Bárbaro – sound better than that night, a-cappella between her and her 8? year old son Jorge Andrés. And wait for it, Fiorita has a voice! Nidia is a wonderfully talented musician, an amazing story-teller, a gracious host, and a proud ambassador of the music of the Pacific Coast of Colombia. (She tells me she makes a mean sudado de piangua also – so bummed to have missed that.) I don’t exaggerate: her group is magical to listen to. If you happen to be in Austin for SXSW (or if you are thinking about making the trip), please don’t miss this rare opportunity to see them!